For reasons external to Japan, the new policy framework has become more stimulatory to the economy and comprised an accelerant of JPY weakness. At the time we noted that yield curve targeting could be highly positive for the economy and negative for the JPY were PM Abe’s government to launch a wave of fiscal stimulus and increased issuance, which could require the BOJ to expand money supply to prevent yields from rising. However, we doubted the government’s commitment to reverse its overly restrictive fiscal stance. Instead, the path to stimulus has come from external events. The BOJ’s policy switch took place at a time when global bond markets had been weakening, and since Trump’s victory the decline has accelerated as the market has focussed on the reflationary aspects of his economic policy pledges. (Trumponomics – What if President-elect Trump does not pivot economically to the centre?) 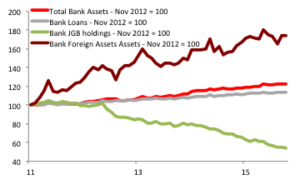 JGBs have weakened in response to this slide on G10 bond yields. 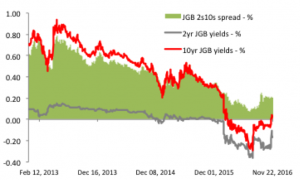 This has seen the JGB curve steepen and 10yr yields rise above the BOJ’s 0% cap. They currently measure 2bp. 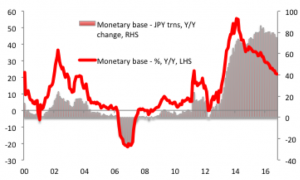 This has raised expectations of the BOJ having to accelerate the pace of it’s JGB purchases in order to maintain it’s new monetary anchor, thereby accelerating the infusion of fresh liquidity into the economy. Potentially, the BOJ’s capacity to inject liquidity into yhe economy under the yield curve-targeting regime would be limited only by the availability of investors wiling to sell JGBs. (In this sense, the BOJ’s yield curve targeting does not quite offer the unlimited capacity to intervene that the SNB’s 1.20 EUR/CNF floor did, but it remains sizable given that JGBs are the world’s largest bond market.) This, combined with a widening spread of USD-yields to JPY yields (the 2yr UST/JGB yield spread has risen to 125bp from 102bp at the time of the 21st September BOJ meeting) has supported an acceleration of USD/JPY into the current phase of USD-strength. 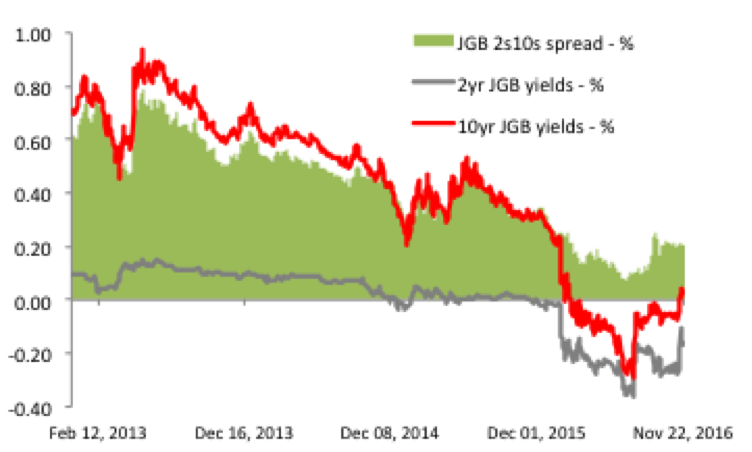 The pro-cyclicality of the BOJ’s new framework reflects its sensitivity to the level of JGB yields. 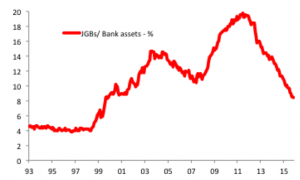 The recent rise in JGBs has provided the BOJ with plenty of leeway in which to expand it’s asset purchases. 10yr JGB yields are currently positive while the curve is steep with the 2s10s spread, for instance, currently at 18bp. The BOJ could, should it wish, drive JGB yields notably lower before the negative carry on holding JGBs offset the positive slide that could be obtained via a steep curve. In contrast, a repeat of the situation in the JGB market in July and August would have left the BOJ with far less room for manoeuvre: on July 27th, for instance, 10yr JGB yields measured -29bp and the 2s10s slope was just 7bp, implying that the revenue to be gained from sliding down the yield curve struggled to offset the negative carry of holding JGBs; under these circumstances, were the BOJ to be following it’s current yield curve targeting regime, it could only BOJ expand its JGB buying were it to steepen the curve further by cutting short rates. In the current climate it is possible that the USD/JPY uptrend extends towards the 120 levels, which have provided something of a bound on Abenomics-related JPY weakness. Had trump not won the Presidential election that the external circumstances would have been far less favourable. A Clinton victory would have largely represented a continuity of a policy mix of overly tight fiscal policy, overly tight financial sector regulatory policies and a Fed that was determined to hike. This would have rendered USTs a buy and would have kept US/ global growth and inflation expectations grounded. As Napoleon said of his Generals, good fortune is a property that can be as valuable as ability. Hope for Trump heralding a broader move to policy reflation among major economies seems premature: in the UK, the forthcoming Autumn statement looks poised to deliver a fiscal stimulus far smaller than the 2% of GDP required by an economy facing Brexit uncertainty; in the Eurozone, continued fiscal hawkishness renders the ECB the sole realistic agent of policy reflation; in Japan the second Arrow of Abenomics – fiscal reflation – remains firmly in the government’s quiver. Trump’s protectionist policies and the move towards higher US yields pose a considerable risk to emerging markets. Asian economies may be particularly vulnerable as Trump’s trade policies could reverse the dynamic that has dictated economic growth for the past 30 years: over that time it has been better to be the exporter rather than the importer of deflation; trump’s new trade policy may require global surplus manufacturing capacity to be eroded at source – which is deeply deflationary for Asia’s manufacturing economies. (Trumponomics – What if President-elect Trump does not pivot economically to the centre?). Even in the US, we do not yet know how strong will be the actual fiscal stimulus and the extent to which this will hold at bay the left-tail economic risks stemming from Trump’s broader policy agenda, such as protectionism. Financial markets themselves pose risks as Trump represents a regime shift to the post-2010 policy of monetary stimulus and falling yields that has unpinned a clustering of correlated investment strategies (short gamma, carry, risk parity, emerging market, etc) as well as increased corporate leverage in many core economies, including the US. The pro-cyclicality of the BOJ’s new policy framework could exaggerate the JPY-impact of a period of risk aversion that would drive JGB yields lower. As noted above, lower yields could limit the pace at which the BOJ could inject liquidity into the economy. 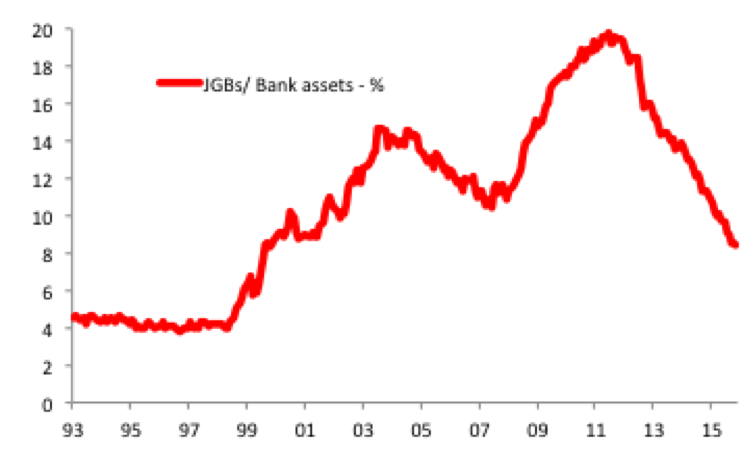 Moreover, the new framework could hasten this policy dilemma since it rewards Japanese financial institutions that hold a deflationary, JGB heavy portfolio and could inflate demand for JGBs. The BOJ is effectively guaranteeing that the JGB curve stays steep enough that the positive slide from holding JGBs outweighs the potential negative carry were JGB yields to again be negative. This provides a comforting and familiar source of income for Japanese financial intuitions as they buy JGBs and ride the curve. Even with the tailwind of QQE, the Japanese authorities have failed to reflate the economy or accelerate the flow of liquidity into risk assets. 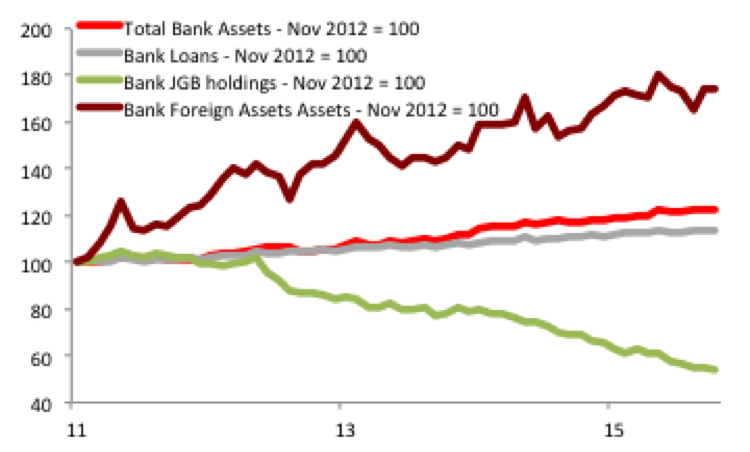 (FX hedge ratios on overseas asset purchases are little changed during the Abenomics era for instance.) Into a risk-off event, the yield curve targeting policy would create a headwind for Japanese institutions risk appetite and could accelerate JGB strength. BOJ QQE at the targeted JPY80trn a year pace may be inconsistent with an asset allocation into JGBs by Japanese financial institutions. One can easily see the BOJ being in the situation when JGB yields decline back to levels where the positive returns from a steep curve no longer compensate for the negative carry of being long JGBs. 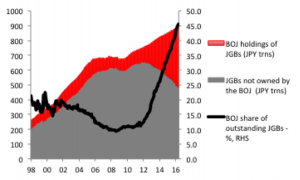 Under such a situation, the BOJ would be forced to steepen the curve by lowering the call rate (which it is reluctant to do and which may only provide a temporary re-price as the curve swiftly re-prices) or taper it’s JGB purchases. For these reasons, the pro-cyclicality of the BOJ’s new policy framework injects additional downside convexity risk into USD/JPY. For now, global and Japanese policy settings and growth and inflation expectations argue for continued JPY weakness, and USD/JPY rising towards 120 over the coming months remains possible. However, the growing risk of a discreet, non-linear correction lower into a risk-off event suggests that investors could consider investing part of their profits in the short-JPY trade in downside protection. Moreover, beyond 115, we would be inclined rotate USD-longs out of JPY and into the EUR or Asian emerging market currencies. This entry was posted in Event Risks and Left Tail Events, Fiscal Policy Activism, Monetary Policy Expansiveness, Opportunities and Right Tail Events by Des Supple. Bookmark the permalink.